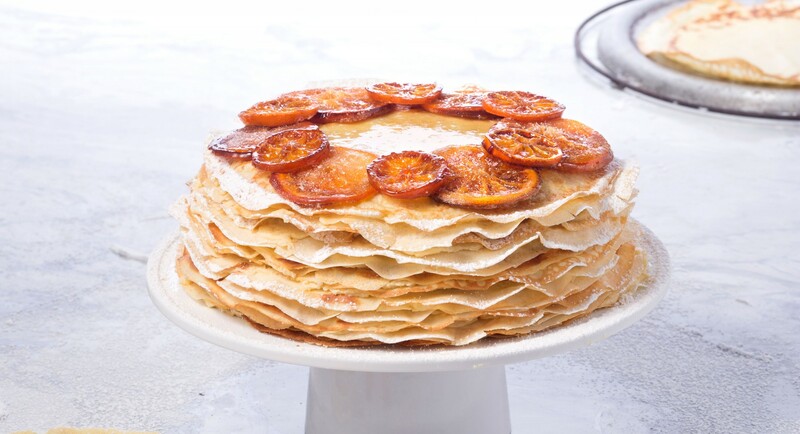 A classic French mille crepe cake couldn't be more stunning: Slicing into it reveals layers upon layers of delicate almond-orange cream sandwiched between thin, airy crepes. Though this gluten-free version is a bit time-consuming to make, the wow-factor is well worth it. Whisk together flour, salt, and sugar. Whisk in eggs to create a thick paste. Slowly, working in batches, whisk in milk, then melted butter. Set aside. Heat 9-inch nonstick skillet over medium-high heat. Spray with nonstick spray. Pour scant 1/4 cup batter into skillet and swirl to coat bottom evenly. Cook until top appears dry, loosening sides of crepe with spatula, about 45 seconds. Flip and cook until brown spots appear on second side, about 30 seconds. Turn crepe out onto plate. Repeat with remaining batter, spraying skillet with nonstick spray in between, and stacking finished crepes on plate. For the frangipane mixture, combine almond flour, sugar, and salt together in the bowl of a stand mixer fitted with the paddle attachment. Beat in the softened butter until creamy. Beat in egg yolks and orange zest. Alternate stacking crepes with a layer of frangipane cream in the center until all crepes are used. Garnish with powdered sugar and candied oranges.